Contact dermatitis is a type of dermatitis (skin inflammation) that develops as a consequence of direct exposure of the affected skin to different allergens or certain irritants. In some individuals it may be hard to identify the actual trigger of skin inflammation because many common chemicals are, for instance, found in a variety of household products or cosmetic products. Some people may develop contact dermatitis due to exposure to an irritant at work or while indulging in a hobby or some leisure activity. No matter what the cause is, it is best if it can be identified. Patients are easily treated and symptoms and signs of skin inflammation soon subside, but if one does not know the trigger, he/she may not be able to protect himself/herself from recurrence of the condition. The very location of the skin inflammation may be of great help when identifying the trigger that has led to contact dermatitis. Still, one needs to know that some parts of the skin are much more susceptible to irritation and subsequent inflammation. Contact dermatitis of the eyelids is frequently reported. This skin problem is in the majority of cases associated with certain cosmetic products. However, there are also other potential triggers of eyelid contact dermatitis. These include airborne allergens (pollen, fumes etc. ), hair dyes, nail polishes, fingernail coatings and resins, eyelash curlers, mascara and its applicators, shampoos and conditioners and hair gels or sprays. Facial contact dermatitis is most commonly associated with application of different cosmetic products. Most of them are actually the same as products capable of causing eyelid contact dermatitis. However, the face may also get inflamed due to several more triggers. Namely, it is possible to end up with facial contact dermatitis if one uses a sunscreen containing potential allergen, if he/she needs to use some topical medications or even if the face comes in contact with some children's toys or balloons. Facial masks as well as a partner's facial cosmetic products may also irritate the skin and induce dermatitis. The scalp is not so susceptible to dermatitis. Even in people who are suffering from eyelid or facial contact dermatitis the scalp may remain unaffected. Still, if the condition occurs, it is frequently associated with hair dyes, shampoos, conditioners, hair gels and sprays, mousse, strengtheners as well as many other hair products. 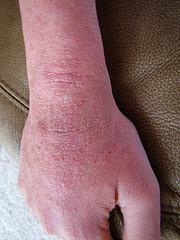 Dermatitis may occur even if an individual have been using the particular cosmetic product for many years. But, it most commonly occurs after only one application of the causative agent. What do you prefer, cheap or expensive cosmetics? How do you organize your cosmetic products at home? Bag or boxes?